As I mentioned in the G42 thread, I sold the G42. Just didn't use it at all and it sat in the box. No problem. I made a profit on the sale. As I mentioned also in that thread, I really didn't 'need' anything and had no desire for anything in particular. So I'm at Costco today with my wife and I'm browsing Armslist. 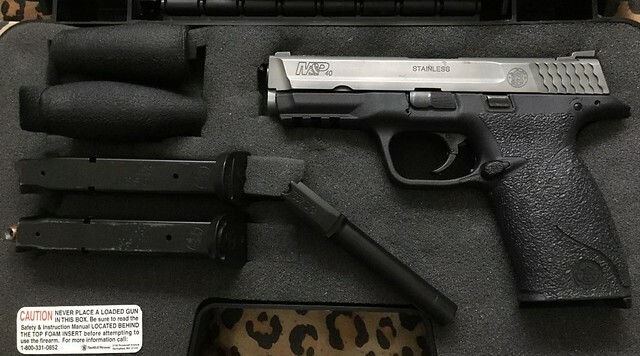 There was an M&P full size (I think the 4.25 inch barrel version is the full size) in .40 S&W, Trijicon night sights, couple of 15-round mags and .357sig conversion barrel for $400. Looked around and that seemed to be a good deal so I contacted the seller. Turns out he's 5 minutes away so I met up with him and bought it. Looks good. I'll post some pics later. If anyone has experience/opinions on Smith's M&P line feel free to shout out. My only experience with this line is the Shield I gave my son. That sure didn't take long. That money must have been burning a little hole in your pocket. Just looking for something that tickled my fancy. I like .40 S&W so that was a plus. I didn't have a .357sig so that was a plus. It already had night sights so that was a plus. So I figured I'd give it a go. I'll make this my new 'woods' gun which will move the G22 to HD. That moves my other G26 over to the wife's HD back up which is a win going from a 7-shot .380 acp to a 16 shot 9mm and a package she can better control. Forgot the mention the M&P has a SS slide which looks nice. Just goes to show why there are so many different flavors. All of the pluses you list would be negatives for me. You should be happy with it though. They are good guns with solid industry support and proven track record. Plan to go to the range next Monday with the wife. I'll take it out for a test drive then. I'm confident it will be fine. Cleaned and oiled it up tonight in preparation for next Monday's range trip. Found the spent shell envelope under the foam padding with a born on date of 10/2009. So almost 10 years old. I have an M&P thread going on a GT right now and we've been discussion recoil springs. Being as my M&P is almost 10 years old I thought it prudent to look into changing out the recoil spring/guide rod/mag springs. I have no idea of previous round count or prior maintenance so figured it a prudent step. One guy in that thread is a LEO somewhere in this area that is issued the M&P .40 and also has several personally owned. He has an older one like mine with 10K rounds on the blue 16 lbs spring, which is what I have in mine right now. Some folks were saying that S&W has increased the lbs on their springs in current production. I called S&W just now and explained that I just bought a 10 year old M&P .40 and that it has the 16 lbs blue spring and to see what they recommend. Tech said that the 16 lbs blue spring is fine but that current production does have a 20 lbs spring. He then offered to send me one as part of the warranty. That's excellent CS! Now I'll just see about changing out the mag springs and I should be all set. And on THIS Episode of "Dave's Gun of the Week...SMITH & WESSON M&P!" But seriously - sweet deal. I still say that any Glock, XD, or M&P is a no-miss weapon right in the box. They are like the Toyota, Honda, and Hundai of guns. Great performance, great price, great reliability. I waited to see if I'd receive that 20 lb spring from S&W. It came in today so the plan is to take it to the range tomorrow. I'm looking forward to shooting this gun. Okay, got back from the range just a bit ago. Shot the M&P 40 and one of my Sub 2K's. M&P 40: It's doable. The trigger is different than say a Glock trigger in that I can't feel a discernible reset. It isn't terrible, just different. It will work for the intended role I'm envisioning for this pistol which is a woods carry pistol. It was accurate. It had some pop using Federal and Winchester 180 grain rounds but was manageable. I didn't use the .357sig barrel because I didn't buy any .357sig ammo. Basically because it was $28 for a box of 50 fmj at Walmart and I didn't feel like springing for it. And I'll be using it as a .40 S&W anyway. The extra barrel is nice to have and if I find ammo at what I consider a reasonable price I'll try it out. So basically I like the pistol. I think it will fit the woods carry role very well. And it looks like it will stand up to the role which would entail getting sweated on and taken through the brush and brambles in anything from cold to muggy hot. Not to mention often high humidity. I think it will do quite well. I'll look into getting a holster (probably along the lines of a Blackhawk Serpa) and replace the mag springs.